The following steps show how to define and test a simple ‘hello world’ function using the web portal provided by FogFlow Task Designer. Once you click “FogFunction” from the popup menu, a fog function element will be placed on the design board, as shown below. You can start to configure a fog function once you click the configuration button on the top-right corner, as illustrated by the following figure. Please specify the name of your fog function. Please click “SelectCondition” from the popup menu to place a “SelectCondition” element on the design board. Configure this element to specify the entity type of your input data. In the following example, we choose “Temperature” as the entity type of input data for the “HelloWorld” fog function. SelectedAttributes: for the selected entity type, which entity attributes are required by your fog function; “all” means to get all entity attributes. Groupby: this should be one of the selected entity attributes, which defines the granularity of this fog function. granularity determines the number of instances for this fog function. In principle, the number of task instances for the defined fog function will be equal to the total number of unique values of the selected entity attributes, for the available input data. It also means, each instance will be assigned to handle all input entities with a specific attribute value. In the following example, the granularity is defined by “id”, meaning that FogFlow will create on task instance for each individual entity ID. please link the InputTrigger element to the input of your fog function element; then link your SelectCondition element to the input of your InputTrigger element. query: optional, this is used only when your own internal function logic needs to query some extra entity data from the FogFlow context management system. subscribe: optional, this is used only when your own internal function logic needs to subscribe some extra entity data from the FogFlow context management system. for the callback functions query and subscribe, “extra” means any entity data that are not defined as the inputs in the annotation of your fog function. Here are some examples to show how you can use these three call back functions. 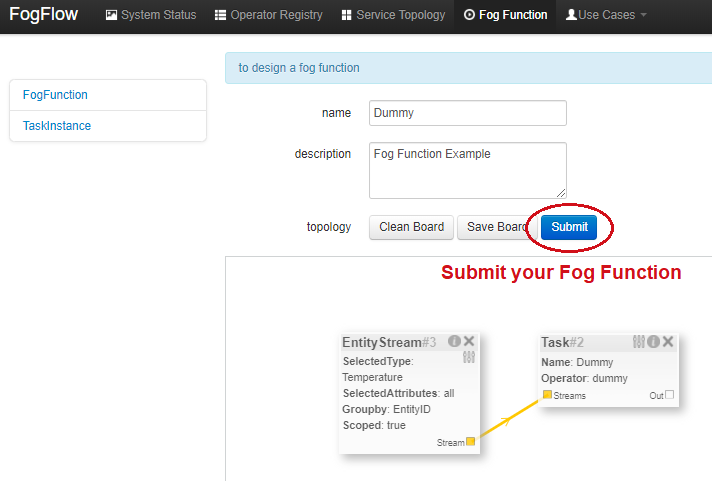 Once you create the button “Create a Fog Function”, the annotated fog function will be submitted to FogFlow. Once the device profile is registered, a new “Temperature” sensor entity will be created and it will trigger the “HelloWorld” fog function automatically. The other way to trigger the “HelloWorld” fog function is to send a NGSI entity update to create the “Temperature” sensor entity. You can run the following command to issue a POST request to the FogFlow broker. You can check whether the fog function is triggered or not in the following way.